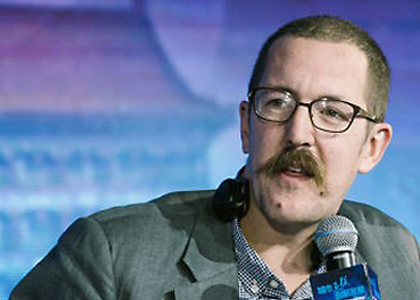 Ben Hammersley is a journalist, futurist and technologist, specialising in the effects of the internet and the ubiquitous digital network on the world’s political, cultural and social spheres. He enjoys an international career as a trends and digital guru, explaining complex technological and sociological topics to lay audiences, and as a high-level advisor on these matters to governments and business. He is currently Innovator in Residence at the Centre for Creative and Social Technologies at Goldsmiths at the University of London; a faculty member of the School of Life; an Academic Fellow at the European Policy Centre, and a non-executive director of Digital Jersey Ltd. In 2014 he became the Principal of Onwards, Friend – a programme to develop science and launch platforms for high altitude and low-earth-orbit. He is Contributing editor at WIRED Magazine, a columnist for BA Business Life Magazine, and a Freelance reporter and presenter at the BBC. Until recently, Hammersley was the UK Prime Minister’s Ambassador to Tech City in East London (2011-13). He was also the Robert Schuman fellow on the Global Governance programme at the European University Institute (2013); a member of the European Commission High Level Group on Media Freedom (2011-13); and a non-resident fellow of the 21st Century for Security and Intelligence at the Brookings Institute in Washington D.C (2012-13). He was also previously Head of Digital at SIX Creative, where he was responsible for creating, building and managing an international team dedicated to bringing cutting-edge internet strategy, design, and production to leading fashion and beauty brands worldwide (2010-11). Amongst Hammersley’s most unusual achievements, is his invention of the word ‘Podcast’. He has spoken at festivals, universities, think tanks and corporations all over the world, including regularly at 10 Downing Street (UK Prime Minister), Deutsche Telekom, European Commission, Brookings Institute, and the Royal Institution. Hammersley is a fellow of the British American project, a trustee of the London chapter of the Awesome Foundation, and a member of the International Academy of Digital Arts and Sciences, where he is a judge of the Lovie Awards. In August 2011 he was made a fellow of the UNAOC, and an Ambassador to the National Media Museum. In addition he is also currently a member of the Scientific Advisory Group at the Royal Institution, and a member of the External Advisory Board at Security Lancaster. Hammersley is the author of the acclaimed book ’64 Things You Need To Know Now For Then’ (2012), which is a guide to the new concepts of the modern world. His most recent book ‘Now for then: How to face the Digital Future without Fear’ (2013), is a guide to the latest ideas in technology, culture, business and politics. It demystifies the Internet, decodes cyberspace, and guides you through the innovations of the revolution we are all living through. In 2014, BBC World News commissioned a major new six- part series, presented by Ben, exploring a global threat that could impact us all. Cybercrimes with Ben Hammersley, produced in partnership with The Open University by Tern TV, delves into the dark world of hacking, now home to a new generation of highly organised cybercriminals running complex commercial enterprises, involving leaders, planners, engineers, infantry and hired money mules.